Georgina Werner wants her husband to make her a tree. Not just any tree. She has a beautiful Texas ‘Traveller’ redbud (Cercis canadensis ’Traveller’) in her front yard, but she thinks it would be nicer if it had purple leaves. The problem is ‘Traveller’ redbud trees are green not purple, and they don’t produce viable seeds. An impossible barrier except Georgina is married to Dr. Denny Werner, renowned redbud breeder at North Carolina State University. Dr. Werner explained that with enough time, patience, and a little luck his wife might get her tree. People have been breeding plants to produce useful and sometime strange results for thousands of years. Science has given plant breeders powerful new tools to combine DNA to produce novel plants. But it takes a creative eye to look at a plant and imagine the possibilities. But endless possibilities don’t end up for sale in the garden centers. It takes many years and hundreds, if not thousands, of hours of effort to create a plant with the right combination of traits to finally make it the garden center and ultimately your landscape. Dr. Werner described the process his popular ‘Ruby Falls’ redbud went through to get into the marketplace four years ago. 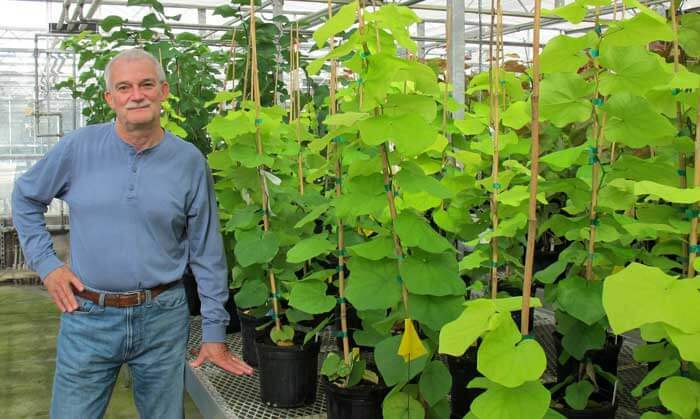 Back in the late 1990s, he and his research partner, Lane Snelling, identified two redbud trees in the JC Raulston Arboretum’s collection that they felt had traits that, if combined into a single tree, would resonate with the market. They began the process of cross-pollinating the parent trees, collecting seeds, growing the young trees and screening for desirable traits. In this case, their efforts resulted in 23 trees with traits they felt might be worth pursuing. They took the trees to North Carolina State’s Sand Hills Research Station and grew the trees there in isolation. Four years later the trees flowered and the next generation of seed was collected. The trees grown from those seeds produced 45 trees with the purple leaf weeping form they were seeking. Werner and Snelling sorted through those trees to identify four individuals that they felt embodied the ideal traits they wanted. Turning four young trees into thousands for the market is beyond the scope of what Dr. Werner’s program can do on campus. That’s where plant propagators come in. In the case of the ‘Ruby Falls’ redbud, Dr. Werner sent wood from his trees to Hidden Hollow Nursery in Belvidere, Tenn. The nursery specializes in propagating redbuds by grafting onto reliable rootstock. 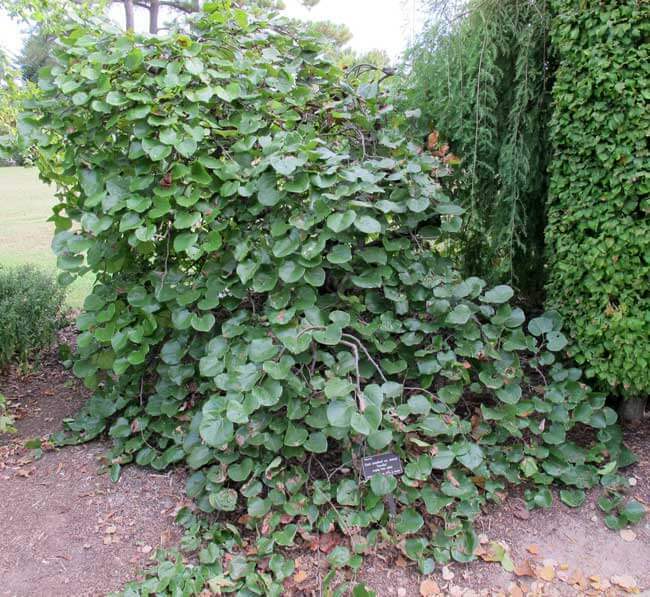 They have propagated redbuds for the JC Raulston Arboretum from the days of the arboretum’s founder, J.C. Raulston, and they do so free of charge because they want to support the research, which brings exciting new plants to the market. They also help Dr. Werner further evaluate qualities that make a plant successful in large-scale production. Even with their decades of experience and expertise, it takes Hidden Hollow Nursery two years before they can transform the material sent by Dr. Werner into trees, which are then sold as bareroot trees to a wholesale nursery like Panther Creek in Wake County. The wholesale nursery will then grow the trees in seven or 15-gallon pots and finally sell them to landscapers or garden centers, who in turn sell them to the consumer for their landscape. It takes nearly a decade to produce young trees that embody the original idea and then another four to five years to produce market-ready plants. Which brings us back to Georgina Werner. If this one seed follows the path of other redbuds in Dr. Werner’s program, it may find its way to a garden center near you. All we need is time, patience, and a little luck. Dr. Lise Jenkins is a NC State Extension Master Gardener Volunteer in Durham County and produces the Triangle Gardener podcast show.